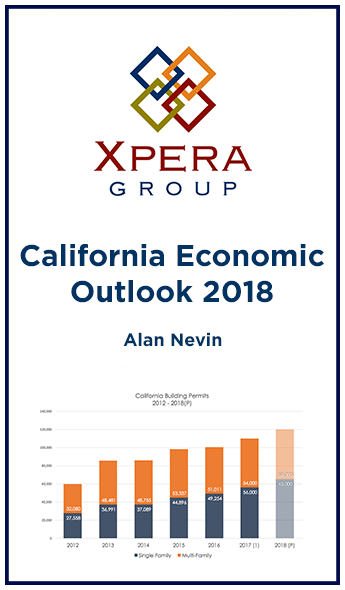 Read Alan Nevin's 2018 Economic Outlook! How will California fare in 2018? The Economy has been vibrant for the state in recent years, but will it continue? Alan Nevin analyzes the trends and data of the U.S. and California to bring you his findings. How will the Tax Act impact California real estate & business? What are the major population changes happening in the US? Which kinds of construction is trending up/down for California? How all of this together is going to impact California's economy! Get all this info here! © 2019 Xpera Group — All Rights Reserved.